That graduate program was in a seminary, so our approach to the unfolding events was perhaps distinctive. Many of our professors prayed at the beginning of class each day, and that morning, those prayers took on new dimensions. Some professors canceled classes. They admitted they didn’t know how to teach in the midst of such unmitigated horror. I recall walking outside our building and looking up at Duke Chapel tower. You can say what you want about Duke, but that chapel is an extraordinary building, and the sight of it usually made me feel like a small part of a big and wonderful world; it was a sentinel ensuring tradition and security. But that day, I instinctively moved away from it because tall buildings had become scary. That it would be anybody’s target seems like a ludicrous response now, of course, but my reaction was a sign of how unmoored people had become in the wake of utter shock. I remember a late morning class — about 11:00 — the last, it turned out, that would occur before the dean sent us all home. To be totally frank, the class was pissed off. None of us were thinking clearly enough to learn. Many of us still hadn’t been able to talk to everyone we knew to be sure of their safety. We all wanted to be at home with our families and friends. Remember that we know the story now, but on that morning nobody knew how many more horrible points would be on the timeline of that day and week. I hadn’t thought much about that day over the past couple of years, but in a planning meeting for this event, the date caught my eye, and I thought through the way I had experienced the day. As I reflect now, I think that professor, who admittedly annoyed me by holding class, was a kind of hero. She was bold enough to claim that we could, by doing what we were trained and called to do, actually help the world. I’m sure she wanted to go back to her office and call relatives or just be alone with the news: she was from New Jersey, and that day the news was a deeply addictive drug that made no one feel better. But she sensed that her obligation to all of us superseded her personal needs. And she knew that the opportunity to have a brilliant and knowledgeable professor, a bunch of eager students (well, more or less eager), classrooms, libraries, theaters, dining hall — all the stuff necessary to learn a profession — that opportunity was a pretty special one, and we needed to make use of it: on that day perhaps more than any other. If nothing exceptional had occurred to upset the routine of that morning, the ideas behind that professor’s decision to hold class would have been just as true. Neither she nor we would have thought much about them, but they would have been true. And not thinking about them would have been a loss. On Wednesday morning, everyone came back to campus. We were humbled, but not scared. We were a little anxious, but not particularly aggressive. We were uncertain about world events, but not so much unsure of ourselves. We were still a little distracted, but we were also more committed to figuring out how we could make the best of our gifts and abilities — how we could best contribute to the flourishing of our communities. If it had been a normal day, there would have been no reason to think through our roles and our commitments. Just as there is a danger to a life of only normal days, there is a danger to having a job that feels normal. You might be thinking, “of course there was a special commitment arising among your peers: you were in seminary and society felt itself in peril.” Society in peril spells full employment for seminary students. Do we as business mangers and leaders really have a part to play? Some noble endeavor to conduct? 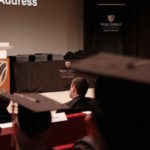 But what that professor was thinking as she went ahead and held class — as she moved forward despite suddenly feeling like she couldn’t see ahead very far — arose out of a sense of professional identity and commitment that parallels what we do here in the Business School. She felt a superseding obligation to us — her clients and community — and let that identity shape her actions. She knew that we all had a very specific way to create value and that we shouldn’t be distracted from what we could do best. And she knew that a lot of resources and history had been marshalled to enable us the opportunities we had in that moment, and she wanted to steward them carefully. Perhaps most importantly, she believed that whether that group of thirty people held class or not would have a real effect on the world, and she wanted it to be the right one. She wasn’t seduced by the idea that we were too small or the world too big for our actions and commitments to matter. At least in part, I think graduation is supposed to be a jarring event. It’s a landmark moment. I hope it’s a pleasant one all around, but I also hope that it gives each of us — students, faculty, staff, family, friends — a moment of pause. Take the weekend — everybody deserves a couple of days off. On Monday morning, though, I hope you’ll launch into a new part of your own timelines with a countercultural and even counterintuitive commitment to deeply claim the identity we’ve offered you in the noble profession of business. 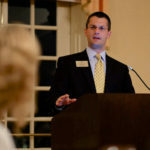 I believe that, even if you wouldn’t have said it precisely this way, when you chose to get your MBA at Wake Forest, you were looking for a pathway toward being a different kind of leader: a business professional. 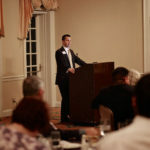 That’s part of studying business in the midst of a liberal arts university: we tend to aim for formation, not training. We want you to be business leaders who are every bit as committed to your profession, every bit as concerned about creating value, and every bit as reflective about stewardship as that professor of mine on that fateful day. To some extent, this is aspirational: it feels a little pie-in-the-sky. But we are obligated toward this aspiration. I hope that something about tonight: the thought of all the time you’ll have (though I’ll warn you it gets filled up really fast); the sight of a big, beautiful Wake Forest diploma with your name on it; turning to the camera to mark the achievement, or the special relief of the ride home — I hope that something about tonight will jar you enough to yield a commitment — hopefully a renewed commitment — to engage in business as noble professionals. I commend this commitment to you as a challenging obligation and a lifelong aspiration. 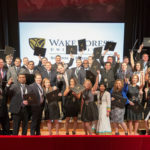 Please know, on behalf of my faculty and staff colleagues, you are now alumni of the Wake Forest University School of Business, and so we are working alongside you in that lofty goal. In this, as in all things, this shall ever be your community: we stand ready to challenge and support you, and we are grateful for the ways you challenge and support us too.